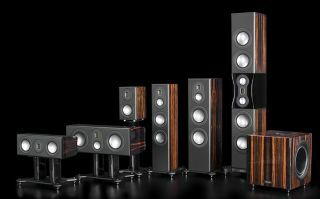 Monitor Audio unveils new flagship Platinum Series II speaker range | What Hi-Fi? It has taken several years to develop the Series II version of Monitor Audio's Platinum speakers, which start from £3150 a pair, and they'll go on sale after CES in January. Monitor Audio's current Platinum series has been around for nearly 15 years, and we've been using it as the mainstay of our surround sound system in the What Hi-Fi? home cinema test room for several years. But it's about to be replaced with the all-new Series II which goes on sale in January. Although it will be officially launched at CES in Las Vegas in January, we managed to gain a sneak preview. There are seven speakers in the range, starting at £3150/pair for the PL100 II standmounters up to £15,000 for the nearly 2m-tall PL500 II model. One of the technical highlights is the new Micro Pleated Diaphragm (MPD) high-frequency transducer used across the range. This uses a thin, low-mass pleated diaphragm with a surface area eight times larger than that of a traditional dome tweeter, which is said to offer greater accuracy and efficiency. Monitor Audio says its MPD tweeter operates with a uniform output to over 100kHz. As for the RDT II bass and midrange drivers, they use a composite 'sandwich' structure made from ultra-thin low mass skins, bonded to a honeycomb Nomex core material. Unlike the RDT construction for the original Platinum, which used two C-CAM skins, the RDT II uses C-CAM for the front skin and the rear skin is made from a woven carbonfibre material. In addition, Monitor Audio's engineers say they have reduced distortion at the upper end of each driver's range by coupling the voice coil with the cone using a nylon ring in place of aluminium. This so-called 'Dynamic Coupling Filter' (DCF) is said to act as a solid part up to the crossover frequency, and above that it acts like a damping spring, reducing the transmission of energy between the voice coil and cone. An improved crossover design incorporates new air core inductors in the mid-range and tweeter sections and laminated steel cores for the bass sections. Platinum II's bespoke speaker terminals are precision milled from solid copper with Rhodium-plated conductor parts. The terminals can accept a spade, 4mm banana plug or bare wire up to 4mm in diameter. As befits a flagship range, there's a choice of natural wood veneers in Santos Rosewood or Natural Ebony, applied and hand-finished with 11 layers of clear gloss piano lacquer. They can also be bought in a piano black gloss lacquer. The front baffles are hand-upholstered in high-quality Inglestone leather. Each Platinum speaker takes up to 144 hours to make.